Image: Jesse Grant/Getty Images for AMC. If Heisenberg is the one who knocks, then it's Jesse Pinkman who breaks hearts. 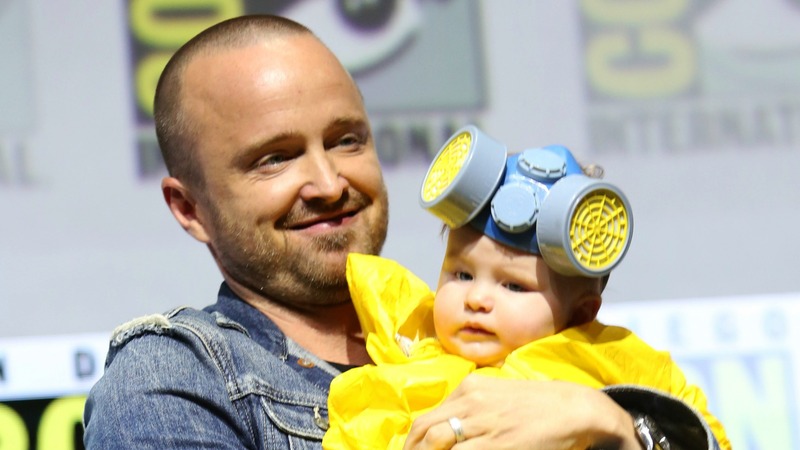 Actor Aaron Paul stole the show at Breaking Bad's special 10-year-anniversary panel at Comic-Con in San Diego, California, by dressing his adorable 5-month-old daughter, Story Annabelle, in a mini hazmat suit and bringing her up onstage. The look, as many fans will recognize, is one that Paul's character often wore on the AMC series as he cooked up meth in the middle of the New Mexico desert with his former teacher (played by Bryan Cranston). I'd never thought I'd say this but, mon Dieu, babies in drug-making costumes are cute as hell. Just look at that tiny face mask! Paul's wife, Lauren Parsekian, captioned a photo of her husband and daughter with Cranston, "Breaking Dads." It seems a great sense of humor runs in the family. Despite this being baby Story's first time at the massive comics convention, she seemed to handle herself like a pro. Who knows? Maybe she was meant for the spotlight just like her incredibly photogenic and talented parents (in addition to looking like a model, Parsekian is the cofounder of The Kind Campaign, a nonprofit organization that combats bullying). Paul seems to be adjusting well to life as a new dad. Back in March, he shared a tear-jerkingly sweet Instagram post celebrating his wife and daughter, saying they were a "constant reminder of how lucky I am to be alive." "To be parents. What a blessing," he added. "What a miracle life is." Though they may look perfect at all times, Parsekian explained earlier this year that things haven't always been sunshine and rainbows since she gave birth back in February. In a lengthy Instagram post, she got real about having mastitis, a painful condition caused by infected and inflamed breast tissue. "This post labor chapter has been rough at times," she wrote. "Recovering from labor is no joke. I'm definitely on the mend in that department but…breastfeeding. Oh man." "While it's been one of the most beautiful experiences of my life, I have developed Mastitis twice within 3 weeks," she continued. "For those of you who don't know what that is, it's an infection from breastfeeding that creates severe flu-like symptoms. Yesterday I was fighting a fever that almost hit 104. It was the sickest I have ever felt. The pain and aches were unbelievable." Hopefully, these painful parenting moments are few and far between so the Parsekian-Paul family can focus on the fun things — like dominating the costume game.